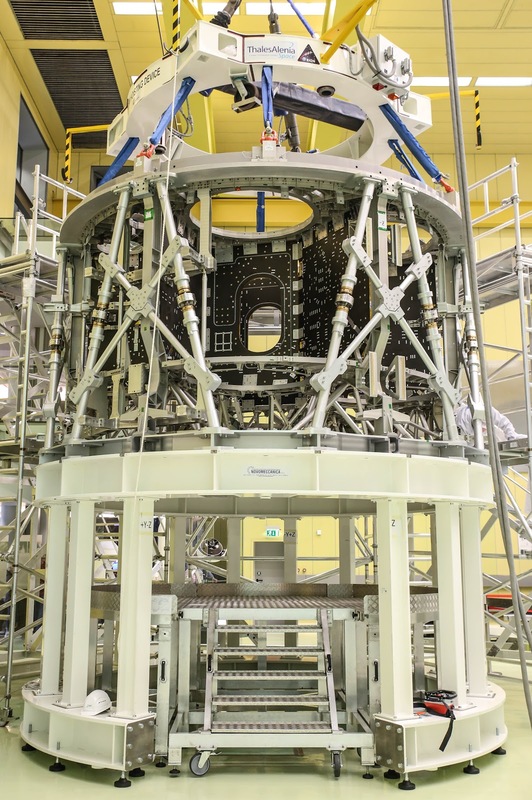 May 3, 2018: The structure for Europe’s second service module for NASA’s Orion spacecraft arrived at the Airbus clean room in Bremen, Germany, last week. Technicians can now start working on installing over 12 km of cables, fuel, water and air tanks, computers, engines and everything else that is needed to support astronauts further from Earth than any human being has been before. Engineers at Thales Alenia Space in Turin, Italy, packed the “chassis” for its transport earlier this month. This is the real thing—its trip from Turin to Bremen is the start of a voyage that will see the Orion spacecraft launched beyond the Moon before completing a lunar flyby and returning to Earth. The European Service Module is a crucial element of Orion, providing support to the crew module that will house up to four astronauts. The crew will travel over one million kilometers in total. The module provides structural rigidity to the Orion spacecraft much like the chassis of a car. It absorbs the vibrations and energy from launch and protects them from micrometeoroids and space debris. Connecting the crew module to the launcher it also absorbs the vibrations from NASA’s Space Launch System rocket that has the equivalent thrust of 34 Jumbo Jets—holding everything together for the wild ride into space. Astronauts will fly Orion 70,000 km beyond the Moon before completing a lunar flyby and returning to Earth. The mission will take a minimum of eight days. The service module for the first mission—without astronauts—is nearing completion and set to ship to the USA this summer. The production schedule for the service module is going at full speed with Airbus technicians working in shifts 24 hours a day. “The arrival of the second flight model structure is an emotional moment for the people working on this unique spacecraft—from here on things get real and things start to take shape—we are sending people beyond the Moon,” says Anthony Thirkettle, ESA’s production manager for the service module. “It is an exciting adventure for European space industry to be part of this mission to the Moon in transatlantic cooperation,” adds Bas Theelen, Orion program manager at Airbus. The Orion spacecraft is built by NASA with ESA providing the service module. The arrangement stems from the international partnership for the International Space Station.